"Build a tower. Make a moat. Maybe sharing's not so bad." Llama Llama has new neighbors Nelly Gnu and her mama stop by for a play date, but Llama's not so sure it's time to share "all" his toys. Maybe just his blocks? It could be fun to make a castle with Nelly . . . But wait--Nelly has Llama's little Fuzzy Llama The fun turns to tears when Fuzzy Llama is ripped in two, "all because of Nelly Gnu " Mama comes to the rescue and fixes Fuzzy, but she makes it clear: "I'll put Fuzzy on the stairs, until you're "sure" that you can share." 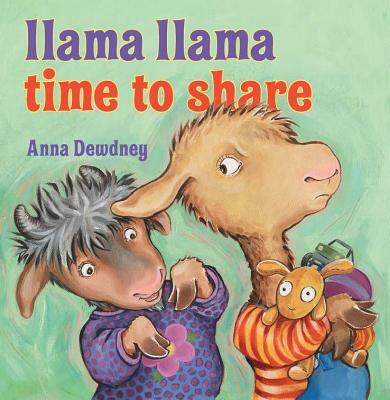 Fun to read aloud and helpful to children and parents alike, "Llama Llama Time to Share" is for any child who needs a little encouragement in sharing.